In the mood for some spring spruce up? 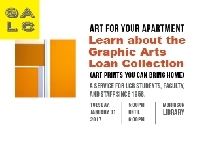 Come see and learn about the Graphic Arts Loan Collection. This is framed art prints you can bring home and hang on your wall for the school year. Prints comprise a survey of movements and artists - from Impressionism to Cubism, and from Rembrandt to Miro. This special event takes place in the historic Morrison Room (housed within the Doe Library). A brief presentation will be followed by lots if time to browse representative works and initiate the borrowing process.